Massachusetts Institute of Technology, based in Cambridge, Massachusetts, was named the winner Saturday after a competition among more than 1,000 college students at Texas A&M University in College Station. 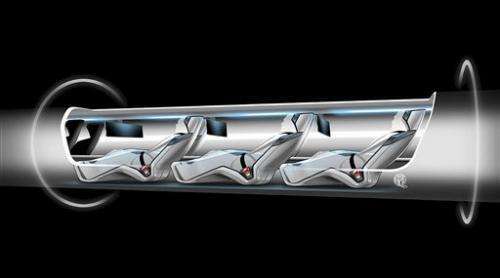 The Hyperloop is a high-speed ground transport concept proposed by Musk to transport "pods" of 20 to 30 people through a 12-foot diameter tube at speeds of roughly 700 mph. More than 100 university teams presented design concepts to a panel of judges in an event that began Friday. Delft University of Technology from The Netherlands finished second, the University of Wisconsin third, Virginia Tech fourth and the University of California, Irvine, fifth. The top teams will build their pods and test them at the world's first Hyperloop Test Track, being built adjacent to SpaceX's Hawthorne, California, headquarters. Still wondering how are they going to make the actual loop itself in earthquake ridden California. A quake anywhere would probably be a disaster. How many inches shift would it take for this to go off safe parameters and shred the capsules and their contents? I would guess not much. indio007, I was wondering the same thing. I was on the maglev in Shanghiai, at top speed you get thrown around a lot, indicating that the track is not straight. A maglev track has got to be a lot easier to build than a partial vacuum tube. It will take some serious engineering to keep a vacuum and allow the tube to flex to take up ground movement, temperature expansion, wind etc. Lischyn: The hyperloop is not a static partial vacuum. It is a dynamic partial vacuum formed by the shape and an air movement mechanism (fans or jets). Thus the high tolerances you indicate are not required. Conventional rail is also sensitive to earthquakes and rails often are shutdown due to earth movement after earthquakes. Since the hyperloop tube is mounted on towers, it is easy to put the tube on flexible joints / rollers that tube to shift during an earthquake. This would be necessary anyway to allow for thermal expansion. It seems more difficult to make conventional rail earthquake-safe. Hyperloop avoids all the normal dangers of conventional rail, so it is overall much safer. I believe that we're not talking about a few inches but in feet as a possibility. You mentioned rollers which I know they (engineers) use for bridges and sort. Can we build a 3D expansion system to adjust the alignment of the tubes automatically? With any luck they would have 15-20 seconds of warning of an imminent quake, hopefully enough time to slow the capsule down before the first real shaking started. A shallow inland fault could be a problem. I used to be a naysayer about this idea, however, as the above commenters point out, it is probably no more prone to disaster than a 300 mph train. The only real difference between crashing at 300mph and 700mph is the time it takes to identify the remains. The only real difference between crashing at 300mph and 700mph is the time it takes to identify the remains. I don't agree. At the end it depends on how much time they need to break. At 700mph, you need to dissipate about 5 times more energy than at 300mph. So it takes 5 times more time to stop ( using same breaking technology and weight factor ). Speed can really make a difference. Even assuming a stopping speed of 1s per 100mph (that's 4.5G!) you're still looking at a stopping distance of 1-1.5km and a massive 7s to stop. I doubt they would want to subject anyone to 4.5G for that long even if it is an emergency stop, so you're probably looking at 2 or more km at least and 10+ seconds. If they want to build it in California, they must have a valid anti-earthquake design already surely? It wouldn't be terribly difficult to build raised platforms or towers that have isolated bases and bracing that would allow for a significant amount of deflection while maintaining their strength and likely preventing damage to the steel and machinery mount to the steel. There are plenty of oil and gas pipelines in these earthquake hot-spots that have to meet the same sort of tolerances. The AISC code requires any structure in set "zones" to follow very strict guidelines of force whether in shear, moment, or deflection. This is coming from a 15 year veteran of structural steel design who is currently in school for civil/structural engineering. I have designed many structures that have to withstand these forces for extended lengths of time while also needing to have solid performance under very demanding industrial environments. Trust me, this can be done, and is done much more often than you think. There is a ton of materials and methods that are used in industrial vibration and mechanical noise control, that even the average bridge designer is not aware of. They necessarily stick to tried and true functional methods as we don't allow for theory and experiments, for the most part, in the world of bridge building, or high speed rail systems. This is because we know what we've got works and doesn't kill people, and it ends there. Use the functional method that is already in hand, which has the desirable attributes: A history, functionality, cost, reliability, predictability. The end. In the case of the Hyperloop, these more advanced methods and techniques that are not in use with the bridges and high speed rail systems....those will begin to come into play. There is good evidence that these more advanced and newer methods and materials can meet the task at hand.